Brainstorming: Brainstorming originated in the world of advertising in the 1940s. Brainstorming is a creativity tool that is very effective when an individual or team is ‘stuck’. Brainstorming is a creative problem-solving or strategy building technique that is more powerful when done in a group, because you get stimulated or irritated by the ideas of others. Ideas generated will often surprise you. Brainstorming on your own avoids having to deal with relational problems, but teams have more fun. If you brainstorm on your own, a fabulous tool to use is Mind Mapping (see the Venture Founders Tool). The more graphic among you will love, though others may prefer more linear techniques including classic list-building. Brainstorming is now in widespread use, but often done very badly. There are some rules that are worth following to derive the maximum benefit. Start by deciding upon someone to facilitate. Participants may yawn when you take them through the discipline, but take heart, the results will be worth you getting a bit of stick at the outset. You want to set the most propitious environment for creativity, and clear rules of the game will help. It should be fun, though, and that’s why even outrageous ideas should be captured. They may even turn out to have buried treasure. Keep what gets written down very brief. Allow imagery or drawings, if you like. Here are some brainstorming applications, but I’m sure that once you start to use the technique, you will pretty soon find your own applications, too. Brainstorming is generally referred to casually, when in reality it requires good discipline to be effective. Brainstorming is a group activity because it is about using collective intelligence. Choose a facilitator with the marker pen to be scribe. Be sure to set the issue in very clear terms before you start, preferably in the form of a question. The ‘equipment’ required: colored markers, a whiteboard or a flip chart. You may find that for the editing stage, a pack of stickies will be useful—so that you can write the ideas on them and to make groups. You should take a look at the Venture Founders Tool: Affinity Diagram. Set a time limit before you start—and the facilitator should be a rigorous time-keeper. The rules are simple, but worth sticking to and you might want to give each participant a copy before you start. Stay focused and go for actionable results. 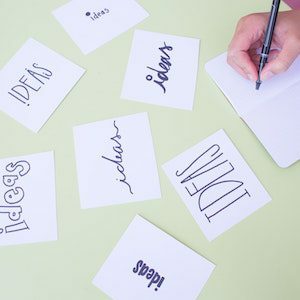 If you get stuck using brainstorming, you will find a lot more help in this Harvard Business Review article, Better Brainstorming, by an MIT teacher.